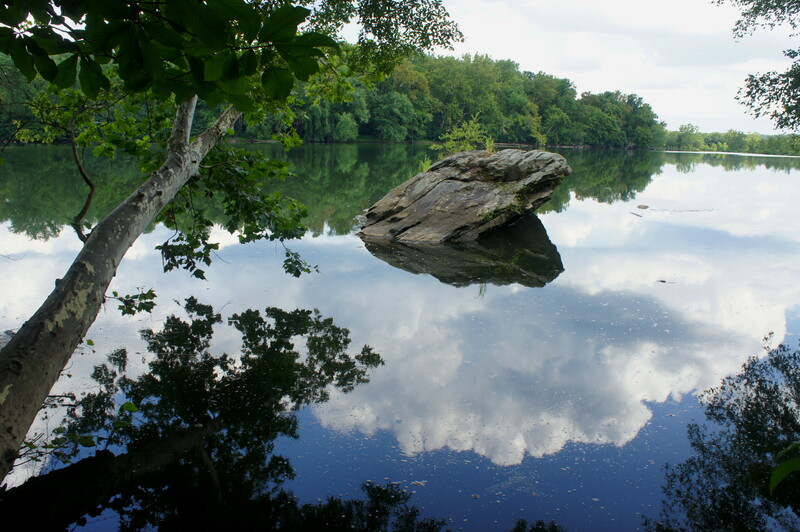 While not nearly as stunning as its southern neighbor Great Falls Park, northern Virginia’s Riverbend Park covers similar terrain with fewer crowds. 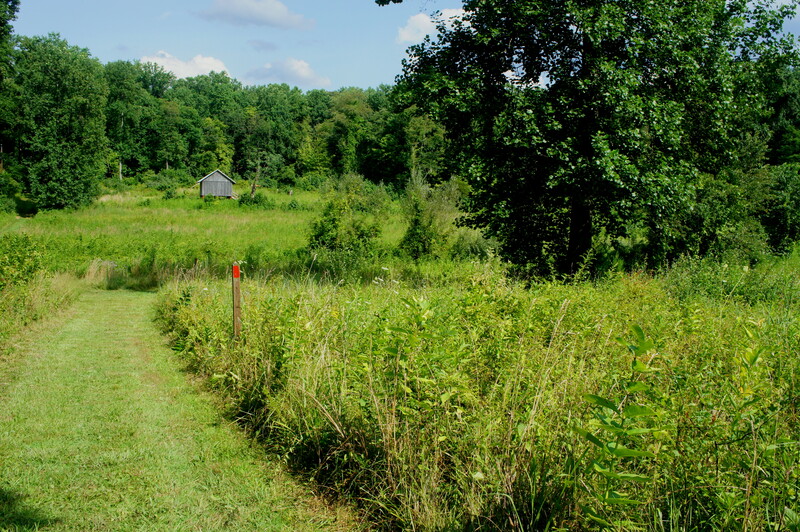 A 3.7-mile circuit around the park—covering the Bootlegger Trail and a section of the Potomac Heritage Trail—covers the best that Riverbend has to offer, including a pleasant stroll along the Potomac River and a jaunt across beautiful Conn’s Farm Meadow. There is, admittedly, a lot not to like—including a mucky green pond, boring fire roads, and an unpleasant portion adjacent to a paved drive—but if calm and relative quiet not far from Washington, DC is what you seek, there’s plenty to be had on this relatively short loop hike. The loop also includes a brief foray into the upper reaches of (much busier) Great Falls Park. 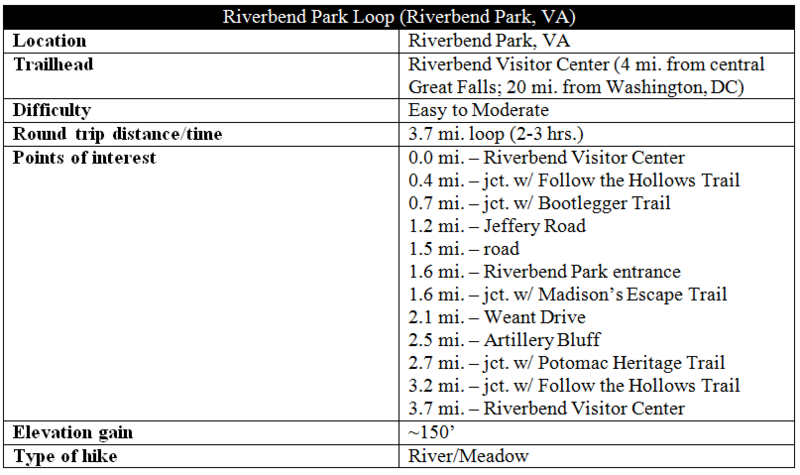 Perhaps the easiest place to start and end this loop hike is at the Riverbend Visitor Center, situated at the end of Potomac Hills Street in Great Falls, Virginia. Follow the signs to Riverbend Park; parking is free, but a small donation is recommended. 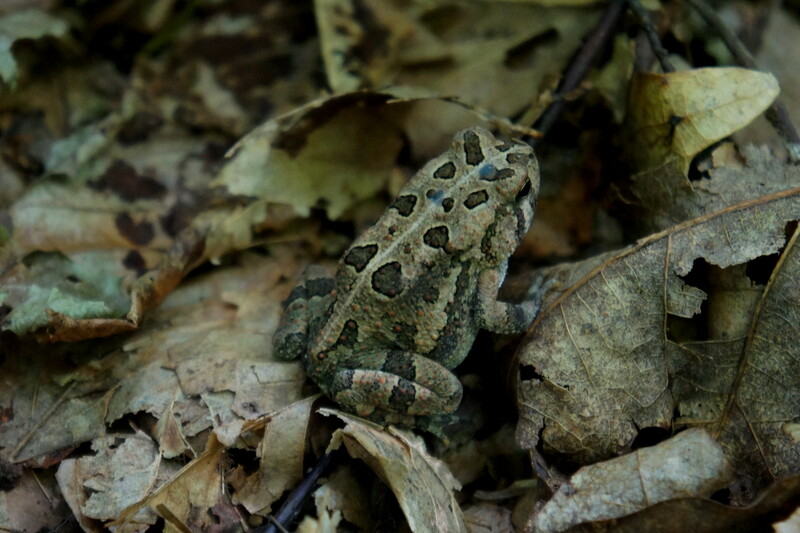 A nice summer day is likely to see plenty of paddlers and picnickers, and the visitor center offers a close-up look at a few of the park’s creatures (including a couple snakes and a rabbit). 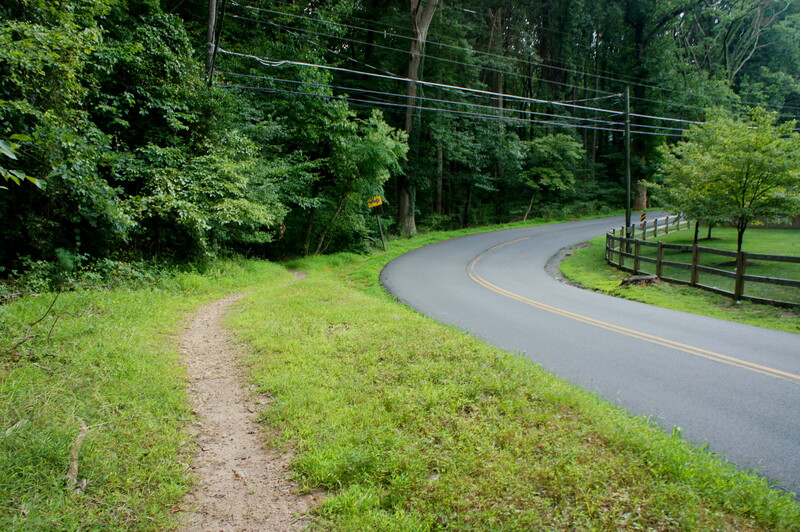 The start of the Potomac Heritage Trail (PHT) is not entirely obvious. To begin hiking in a counter-clockwise direction (probably best to avoid steep climbs), look across the grassy field behind the Visitor Center to spot a tree bearing an aqua blaze. This is the best guide for knowing you’re on the PHT. Immediately the wide path dives into the forest, meandering across level terrain toward the Potomac River. In contrast with the hustle and bustle of the open picnic area, the forest here offers a pleasant cool and calm. For the botany-inclined, small interpretive signs label tree and shrub varieties. Several hiker-made spur trails offer access to the river. 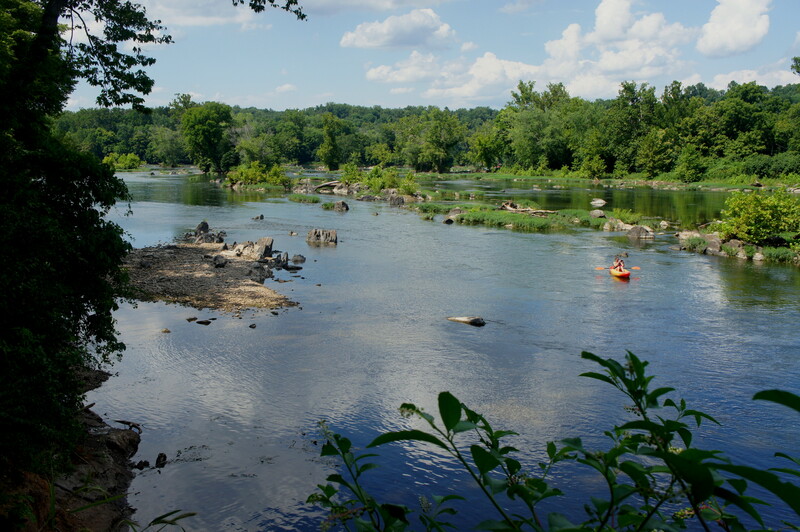 Here the Potomac is largely still, save for one section of minor rapids. Rocks increasingly populate the waterway as one moves upstream near Minnehaha Island and, later, Gladys Island. At a little over 1/3 mile, the trail forks, with the labeled Follow-the-Hollows Trail bearing off to the left. Stay right on the PHT. About ½ mile from the start, a bridge offers passage over Misty Hollow Run, and the trail begins a relatively steep climb to Witch Hazel Bluff, skirting a “protected area” closed for revegetation. In full summer foliage, there are unfortunately very limited views from atop the bluff. Topping out roughly 100 feet above the river, the PHT then descends rapidly to meet the Bootlegger Trail, here simply a partly graveled road. 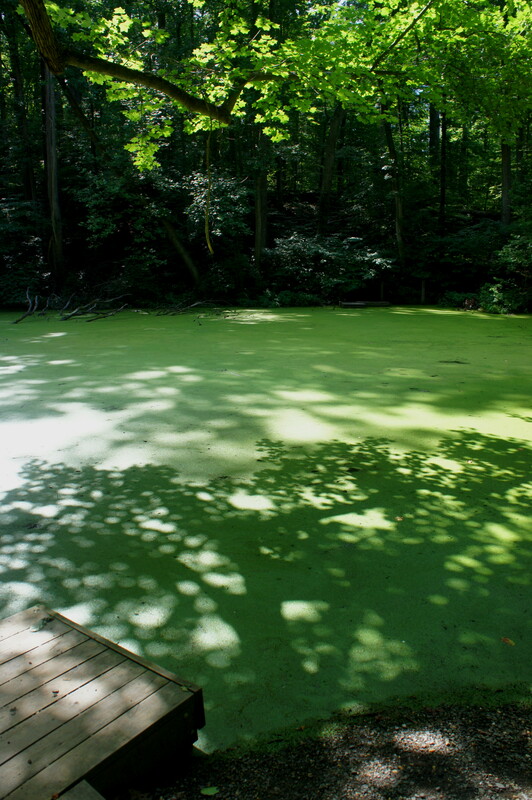 There is a pair of docks at Carper’s Pond, but this is a less than an ideal place to fish; on the day in early August that I visited, the water was completely covered in green algae sludge. While the PHT continues bears right at the pond, loop hikers will want to turn left onto the wide Bootlegger Trail. The graveled fire road climbs gradually, at times paralleling a stream (again Misty Hollow Run) on the left. After passing a junction with a minor connecting trail, the trail traverses relatively flat ground to Jeffery Road, leaving behind a not-so-pleasant section within earshot of a couple residential homes. After crossing the road, follow the red blazes as the Bootlegger Trail cuts left, then traverses sunny Conn’s Farm Meadow. 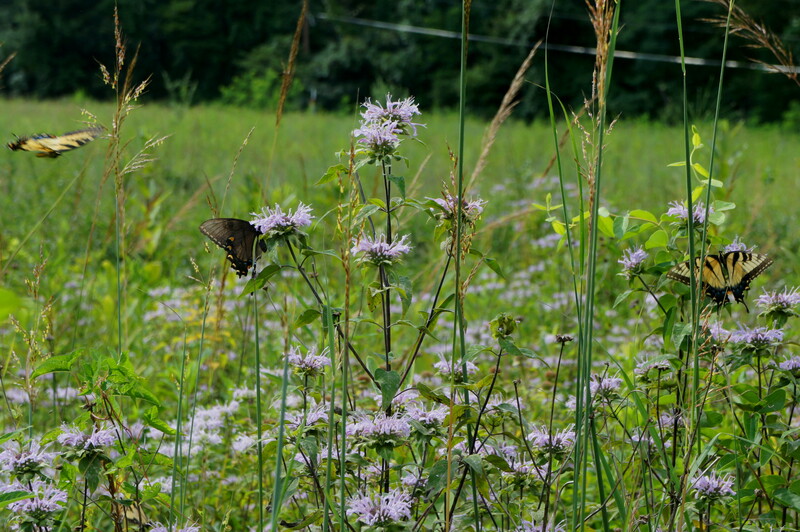 In summertime, the meadow is teeming with chirping birds and lovely butterflies. A small riparian area offers a nice place to stop and look for wildlife. Leaving the tallgrass meadow behind, the Bootlegger path briefly follows another fire road before thinning to a singletrack through thick woods. At around 1.6 miles, the route crosses Potomac Hills Street at the Riverbend Park Entrance. Look for the trail to continue on the other side. Just beyond the entrance, the trail again forks; the Madison’s Escape Trail heads left, Bootlegger continues right. Within a minute, the Bootlegger route undertakes its bleakest section: an unpleasant southbound ramble atop a constructed hillside paralleling Jeffery Road. Low-hanging power lines dangle above. After a few hundred yards, fortunately, the trail cuts back into the woods. The section that follows is enjoyable enough; the trail bears southeast along the deep-cut ravine of Bootleggers Run. Another unpaved road—an extension of Weant Drive must be followed for a short period before dropping again into the forest. After zig-zagging around a series of minor drainages, the red blazes follow a final fire road due south for a couple hundred yards to a trail junction. Bear left. Within 2/10 mile, the trail drops gradually to the brink of Artillery Bluff, where there lies a single picnic table. Again, views are obscured by the summer foliage. The bluff marks the beginning of a very sharp descent southward into Great Falls Park, where hikers will probably encounter considerably more visitors. 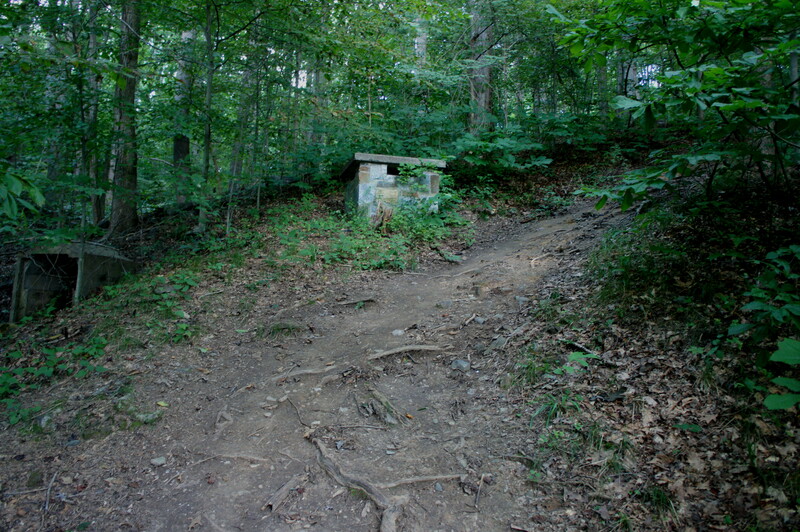 The Bootlegger Trail ends at the bottom of the hill, next to the Potomac River, where one will pick up the PHT once again; turn left at the junction. 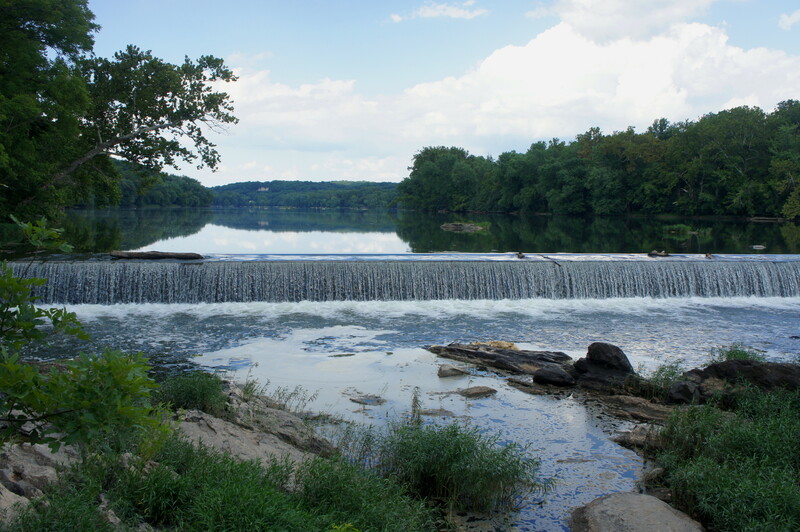 Shortly after the fork, the immensely rocky route passes a lengthy man-made construction: a minor dam spanning the width of the Potomac. Below the barrier, of course, are rapids, the prelude to mighty Great Falls downstream. Beyond the dam, the PHT widens and flattens, making for a relatively easy—if crowded—return to Riverbend Visitor Center. Enjoy persistent views of the peaceful Potomac as the PHT winds northbound back to the start. Allot approximately 2-3 hours for the round-trip circuit. This entry was posted in Great Falls Park, Moderate Hikes, Riverbend Park, Virginia and tagged Artillery Bluff, Bootlegger Trail, Carper's Pond, Conn's Farm Meadow, dam, Great Falls, Great Falls Park, loop hike, Potomac Heritage Trail, Potomac River, Riverbend Park, Virginia, Witch Hazel Bluff. Bookmark the permalink. Great review and exactly on point. Conn’s Meadow offers an amazing array of birds, butterflies, and hummingbirds. My favorite part.